Break into the animation industry and tell brilliant stories with the latest ImagineFX issue, now on sale! 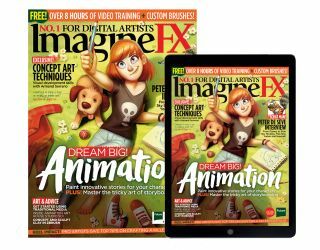 If you want to learn the skills to make your mark in animated films and TV programmes, then this is the ImagineFX issue for you! Inside, you’ll find a detailed workshop by Kenneth Anderson who painted the cover art. Kenneth passes on his invaluable industry experience as he explains how to tell a story in a single image. Then it’s Matt Jones’ turn, who reveals his tips for turning a series of narrative ideas into a cohesive storyboard that conveys mood, action beats and the setting clearly and concisely. Click here to buy our animation issue! In Armand Serrano’s advice-packed article, you’ll learn how to create strong concepts and compositions for animation. Armand’s spent the past 26 years as an animation professional, so he certainly knows his stuff! As do Bao Pham and Howard Lyon, who pass on their knowledge on handling gouache and oils, respectively. Peter de Sève’s an illustrator who’s also worked in the animation industry, at Disney and Blue Sky Studios. We catch up with the American artist, who’s illustrated the cover of The New Yorker for the past 20 years, and find out why one of his inspirations is Frank Frazetta. We’ve also got a new series on sculpting concepts in ZBrush, seven pages of Q&A advice, and industry pros revealing how to put together the perfect portfolio to get you noticed by animation art directors. Another must-have issue of ImagineFX, we think you’ll agree! Check out this slideshow of some of this issue's highlights! Get a free copy of Rebelle, the natural media painting software, worth $60, when you subscribe to ImagineFX. Full details inside the issue, which you can also buy on its own - just click here!